Humanist Discussion Group Meeting - Tuesday, May 7, 7:00 p.m.
Special Night of Harmony at Grounds & Sounds – Friday, May 10, 8:00 p.m.
Mountain Maidens is Marie Mularczyk, Candice Baranello, and Lorraine Berger, three dynamic voices blended in splendid ancient and modern harmonies that will lift your spirit, excite your senses and warm your heart. They sing ballads, folk songs, Medieval, Irish Traditional music, love songs, country and gospel songs including themes of social justice to the accompaniment of guitars, banjo, dulcimer, bouzouki, dumbec, spoon castanets and lots of percussion instruments including washboard. For tickets, only $15, click here. 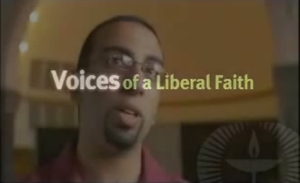 This video was created by the Unitarian Universalist Association to give people an introduction to Unitarian Universalism. 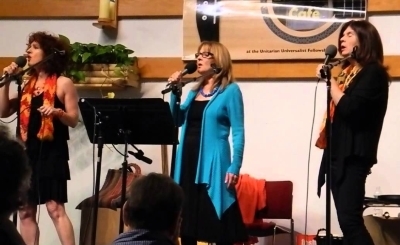 If you are interested in Unitarian Universalism, we hope you’ll visit us to learn more. If attending our services doesn’t fit your life, you might want to investigate the Church of the Larger Fellowship, a virtual congregation of Unitarian Universalists, with more than 3,500 members around the U.S. They hold online services on Sundays at 8 p.m., and on Mondays at 9 a.m. or 1:30 p.m.
You can find them at clfuu.org. March 30 - 7:30 p.m.
There’s a lot to do in this world, and we need each other to do it! Join us for an evening of musical inspiration with Songs of Hope and Empowerment (SHE) with Maureen Shaiman, Bethany Riddle and friends. This event will take place on Saturday, March 30, 2019 at 7:30 p.m. at the Unitarian Universalist Fellowship at Stony Brook. This will be a night of Broadway, folk, pop, and country songs with the common thread of inspiration and hope, and featuring songs written by women. Pay-What-You-Wish-Tickets: For this concert, we will accept Pay-what-you-wish donations to benefit the Unitarian Universalist Fellowship at Stony Brook (UUFSB). The suggested donation is $15, but we invite you to contribute the amount that fits into your budget and we will accept any donation over $1. Paypal will give you the option to include a note. Please specify how many tickets you want at that level if you are purchasing more than one ticket. If you can give $25 or more per ticket, you'll be entitled to special treats. See below. To purchase multiple tickets at one of the levels below, click one of the buttons and then the appropriate amount. Paypal will give you the option to include a note. Please specify how many tickets you want at that level. 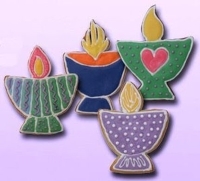 Donations of $25 or more will receive a UU chalice-decorated cookie prepared by Bethany. 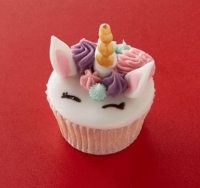 Donations of $50 or more will receive the cookie and a unicorn cupcake prepared by Bethany. Donations of $75 or more will receive the cookie, the cupcake, and a decorated chair at the concert. Donations of $100 or more will receive the cookie, the cupcake, a decorated chair, and the ability to make a song request (must be received by March 1, 2019). Note: Maureen and Bethany have veto power. To get your ticket(s), click on one of the Paypal links above and make your donation. Please multiply your donation by the number of tickets you want and specify the number of tickets in the message portion of the paypal screen. You will not receive a physical ticket, but your name will be placed on the 'ticket holders' list and held at the front door for you. Please print out a copy of your receipt. 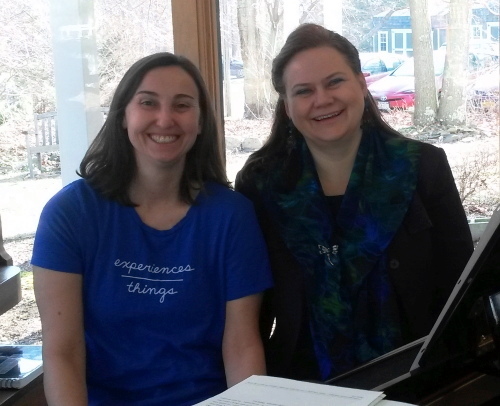 Songs of Hope and Empowerment - March 30 - 7:30 p.m. Thank you! We can't wait to see you March 30!" To obtain the group rate [$15.25] tickets must be paid for by Sun., September 14th; if you want assistance paying for the trip, contact us prior to 9/14. Our train leaves the LIRR Ronkonkoma Station at 8:40 a.m. on Sept. 21st. Ours is the 'head' [most westerly] car of the train, and usually, NYC trains leave on Platform 'A' [north, or ticket-office side of the station]. We will have some coffee & breakfast nosh, so arrive early enough. At Penn Station, we will go upstairs to the LIRR waiting area. There are clean men's & women's rooms; we will have a bathroom break and reassemble in front of the waiting area prior to continuing to the subway. We take the #1 subway train [B'way Local] north to Columbus Circle. Do NOT board until everyone is through the turnstiles and on the platform. This may mean letting a train come and go before we board [I know that is hard! ], but we want to stay together, at least until the March begins, no? At Columbus Circle, we will go up to the street and walk the 1-2 blocks south to 58th St., then west to meet the 'faith contingent' between 8th & 9th Av., where we will have a Spiritual Aligning before we join the March. EarthKeepers: Andy Collver, Deborah Gale, Larry Mazza, Rosie Weisner, Dave Tarbell, John Casper, Judith Dreyer, Alexis Grasso, or Deb Little. Sept. 21st in New York City! 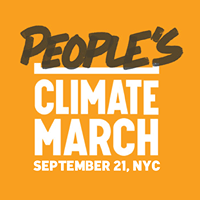 On Sunday, Sept. 21st, our congregation will be joining the People's Climate March in New York City to stand for the future of the planet. We invite members of our local community to join us to travel into NYC to participate in this critical and, we hope, historic March. We march and speak for our Earth and all the life she will sustain to the 7th generation and beyond. Those who cannot march with us in the city are invited to gather at UUFSB at 10:30 a.m. for a meditative service designed to align the energy of those gathering with the spirit and aim of the March. See below to read or here to hear the inspirational words of our minister, the Rev. Margie Allen, on why this is one of the most important events of this century. For more information go to People's Climate March. Well, this is it folks. This is what I have been talking about for four years. We are living into a pristine example of the perfect alignment of three factors that together require of us a clear affirmation or a clear refusal: the call of our faith, a specific urgent justice situation in the world we live in and action for which our congregation is particularly equipped. We practiced this same discernment and response three years ago when a significant number of us recognized the same constellation forming around the question of marriage equality in the state of New York. Certainly part of the reason we exist as a congregation is to respond to unjust situations when we see them, to leverage our numbers in whatever way is needed. Those situations are not always “out there” on the other side of these walls, I might add. Unjust situations exist inside individuals and families. Unjust situations exist within this community itself. 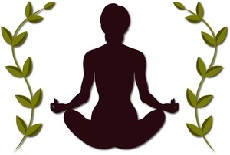 We aspire to the wisdom to notice and the courage to address injustice wherever it arises: to reach out to one of us whose addiction to alcohol is spinning out of control, to protect and advocate for one among us who is physically abused by a spouse, to intervene when our children are struggling to handle a conflict on the playground, to look together for ways we may unconsciously fail to be fully welcoming here to people who do not meet our standard of like-mindedness or education or appearance. One of our reasons for existence as a people of faith gathering regularly is to notice suffering, to listen in the presence of that suffering for the call of our faith and then to respond—resolutely and courageously—in some way that makes a difference, no matter how inconvenient or challenging that action might seem to us in the planning or the execution. We are not on the hook to make everything right in the world. Much of the time, we get to use our time together to rest from the stress of our lives, to restore our hope and energy, to enjoy one another’s company and conversation, to sing and play. We must turn to our common faith and human companionship regularly in order to grow and learn, in order to equip ourselves as agents of love and justice, in order to remember together, again and again, that we are connected to one another, part of a larger web of being. We gather here on Sunday mornings, and at other times, to practice the art of being ever more faithful and effective conduits for the Spirit of Life, our inexhaustible Source of love and hope. But right now a critical mass of people in the congregation have come to understand that there is a situation we can together rally to address. Bill McKibben and 350.org, together with other environmental justice organizations, are asking for as many people as possible to come to New York City next Sunday morning to help world leaders gathering at the UN understand that there is massive popular support for taking definitive action right now to stop and reverse the global warming of our planet. This is an action we are positioned well to take. We do not have to go far. We can use public transportation. Most of us do not work on Sundays. Most of us believe ourselves physically capable of enduring the challenges of a long day of walking here and there amid a massive crowd. One among us has agreed to lead a service here for those who come here that Sunday instead, for whatever good reason. 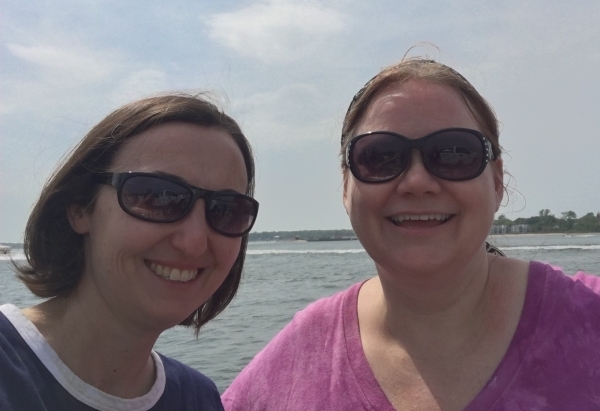 We have been smart enough to arrange for discount tickets on the Long Island railroad and generous enough to offer free tickets to those among us who can’t afford the fare. After the service we have arranged an opportunity to make some signs for the march as we watch a very moving, clear and compelling description of the reality of global warming and the response we will be joining. We have organized an action and are ready to take it. We’re going in, whole hog. We are committed to adding our voices to hundreds of thousands of others in an appeal for immediate and unequivocal international response to the accelerating disintegration of the biosphere that supports all life on earth. If you are still on the fence about joining us or if you are hearing about this for the first time this morning, it is not too late to join us. Today is the deadline for buying LIRR tickets at a group discount. Deb Little or Alexis Grasso will be pleased to add you to our list. We are very close to filling an entire railroad car, nearly a hundred people. We go into the city on one ticket. On board, we’ll each receive our own return ticket and a metro card. You can come home any time you need to. We will march together among at least ten thousand others in the interfaith coalition. You will remember that day for a long time. And maybe that day will, as we look back in the years to come, be seen as the tipping point of the resolve of the human species to avoid self-destruction and the massive extinction of many other sentient beings who are part of the web of life we share. Unitarian Universalism asks us unambiguously to affirm the worth and dignity of every person, our first principle. Our seventh principle, the collective version of individualistic first, asks us to understand and affirm that human life is deeply interdependent with Earth’s organic, hydraulic, atmospheric and geologic systems and all other forms of life on Earth. The web of life itself is the Source and foundation of the survival of all life. When we do not honor the integrity of the web, we risk not only our own survival, but the survival of the whole web of life. Our fourth principle asks us to heed the clear declaration of respected scientists and the results of confirmed research that predicts a global environmental cataclysm that will create for our youngest children a planet we would not recognize as ours when they reach their forties. Our fifth principle asks us to uphold the democratic process. I am going to be talking a lot about democracy this year. Let me just say for now that it is an indisputable fact that our executive, legislative and judicial capacity for justice-making is currently negligible. There was a time when we could have said that our right to vote our conscience as American citizens carries power enough to right wrongs even when our government is unresponsive. Not so now. Your vote to end global warming at the current level of destruction has been bought out from under you. Exxon-Mobil, the world’s largest-ever-in-history corporation and other fantastically rich carbon-venders like it have bought the democratic process. And, further, they are charging you and me untold trillions of dollars for the privilege of wrecking the environment we all share. Their ka-zillion dollars and their story about what a healthy economy looks like has allowed them to legally pass on to society the high cost of their business. They have been able to block efforts to force them to pay for what they call the “externalities” in their business plan. In cahoots with self-interested legislators, they have taken full advantage of every possible tax break, loop hole, special consideration and governmental support. The fossil fuel lobby has deprived you of your voice. They and the corporations they serve have purposefully fed you skewed research that cast doubt on legitimate scientific reports. They hid the truth form you and went to the bank with the profit from their deception. Your voice is Earth’s voice. Your voice is the one that speaks of behalf of the people who are on the front lines of the tragedy of global warming. Without your voice, your vote, your demand, they are the ones the floods will sweep away. They are the ones whose subsistence farms will dry up and wither away. They are the ones who will be decimated by the diseases warmth-loving insect vectors carry. They are the ones the tsunami will terrorize. They are the ones whose river, their lifeline, will cease running. They are ones who will starve and die of drinking contaminated water. They are the first peoples whose sacred land the pipelines will threaten. They are the ones whose neighborhoods will be decimated and not rebuilt. They are the ones who will pay for the oil baron’s “externalities.” In war they are called “collateral damage.” Our UU faith calls them human, worthy, beloved. Our UU faith calls us to speak for them in whatever way remains to us. Our fifth principle calls us to begin to restore democracy by taking to the streets, by voting with our feet for love and life and right. Earth has no voice and no vote. She has only us. History tells us that mass action gets the attention that yields results. Bill McKibben says in the film Disruption that I hope you will all stay to watch after the service, that only 1% of the American public ever participated in a demonstration during the Civil Rights Movement. But that 1% was what it took to bring justice rolling down like waters. In 1972 Nixon watched on TV as the massive response to the first Earth Day unfolded. Shortly thereafter he initiated a cascade of legislation that flew in the face of his party’s priorities, among them the Clean Air Act, the Clean Water Act, the Safe Drinking Act, the Endangered Species Act, the Marine Animal Protection Act, the National Environmental Policy Act, the Superfund, the Environmental Education Act. It was people on their feet in the streets that ended the Vietnam War. The New York City Nuclear Disarmament demonstration in 1982, the largest political demonstration in US history at the time, garnered global attention and subsequent definitive action that lifted all our fingers off the red button of mutually assured destruction. Showing up on the streets shows results. And right now showing up is virtually our only choice. A rose in a history book doesn’t smell nearly as lovely as a rose in a garden and a rabbit feels nowhere near as soft. I want real roses for our children’s children. I will march for babies and for rabbits and for roses. We find ourselves at a tipping point in global grasp of the realities of our situation. This Climate Change thing is not about the destruction of our planet. It is about the destruction of the biosphere: the miraculous, intricate, resilient and fragile system that allows life on the planet to exist. The earth will survive, but not the Earth that can support life. A guy in the film Disruption describes the narrowness of zone within which life is possible. Two kilometers below us, the earth is too hot for life; two kilometers above us, the air is too thin to breathe. Of course, the balance is more complicated, more intricate, more tenuous and more resilient than this. More than two degrees of warming will engage a set of feedback loops, some of which scientists understand and can predict, some of which lie in the mysteries between what we know so far. Certain combinations could easily create a devastating cascade of events that suddenly accelerates completely out of our control and well beyond our capacity to respond. Here are some examples of feedback loops that are described in the film. The Arctic icecap which normally reflects sun away from Earth and keeps us cool is already melting at 1 degree of warming. As the mirroring surface shrinks, cooling capacity diminishes and warming increases and mirroring surface shrinks. And so on, a loop of continuously magnified destruction. As the arctic warms and the tundra thaws, the methane underneath--a form of carbon fifty times more toxic than carbon dioxide--will begin to be released into the atmosphere, exponentially adding to the greenhouse effect and warming more tundra and releasing more methane. A loop of continuously magnified destruction. Carbon dioxide is absorbed by our oceans, acidifying the water. Tiny plankton, which constitute the lowest rung on the ocean food chain, cannot tolerate more than a certain level of acidification. If they die, every bit of sea life will die with them. The whole interconnected web of life below the waves we see will disintegrate and that massive disruption will have devastating repercussions for human beings and other beings that depend on the sea for food and income. A loop of continuously magnified destruction. We are approaching a red line in terms of carbon entering our atmosphere. We passed 350 parts per million of Co2 in the atmosphere long ago. We just recently passed 400 parts per million. Dr. Gavin Schmidt, climatologist and climate modeler at NASA's Goddard Institute for Space Studies, reacted by saying “We are a society that has inadvertently chosen the double-black diamond run without having learned to ski first. It will be a bumpy ride. [“NASA scientists react to 400 ppm carbon milestone” http://climate.nasa.gov/400ppmquotes/]. Out of a trillion more tons of carbon potentially headed for release, we are approaching 600 million. We’ll get there within thirty years if we do nothing and are lucky. We’re now approaching 2 degrees Celsius of warming and events unfolding now will magnify the warming process as they interact. Already we live on a radically altered planet. There is an end point. Life as we know it cannot survive an average increase of 6 degrees. Watching the plans unfold for the People’s Climate March next Sunday has given me real hope. Even as I have been reading humankind’s most awful, frightening news, I have been breathing in the words and images coming out of the organizing process. As you watch the film, you will see the intense engagement of volunteers and leaders, the message of solidarity in the upraised fists, the depth of the planning room conversations, the wonderful variety of colors and backgrounds from which people came, the inclusive, sensitive, mindful regard for minority groups whose members suffer the most in the aftermath of disaster. You see in their faces, in their determination, in their persistence, the passion that kept them moving full tilt through their tight time-line. April to September. That is all the time they had to mount this massive March. So many scientists and activists have given their lives to tracking this issue, again and again bringing the increasing evidence for global warming to our attention, writing books and articles, giving interviews, organizing people and events. Bill McKibben has been on this since 1989, taking up the line left slack in the mid eighteenth and early nineteenth centuries when scientists first began to notice the relationship between carbon emissions and increasing average temperatures. I am sure I don’t know the half of it. But I do know this. You will see what I saw—in the film, in the reading you also will do, in your companions on the march, in the strains of the cello, in the worship we will share at our staging post, in the words of those who have called us together in the city. You will see what noble company you keep. You will see faith in action, religious and non-religious. But faith. You will see it. Here’s how the contingents are lining up and the message each contingent brings to the array. You can see this map on the People’s Climate March webpage, www.peoplesclimate.org. Our cadre is the fifth of six to enter the March. •Frontlines of Crisis—Forefront of Change. The people first and most impacted are leading the change: indigenous, environmental justice and other frontline communities. •We Can Build the Future. Every generation’s future is at stake. We can build a better one: Labor, Families, Students, Elders and More. •We Have Solutions. A just transition is possible: Renewable Energy, Food and Water Justice, Environmental Organizations and More. •We Know Who is Responsible. Let’s call out those who are holding back progress: Anti-Corporate Campaigns, Peace and Justice and More. •To Change Everything, We Need Everyone. Here comes everybody: LGBTQ, New York City Buroughs, Neighborhoods, Cities, States, Countries and More. Come ride, stand, sing, and march with us. Our Mother Earth has a fever. We must take care of her. For our own sake and for our children, we can reanimate our democracy and use it to restore health and wholeness to the biosphere upon which all life depends. 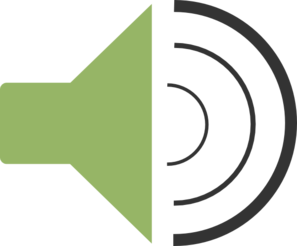 To subscribe to our Monthly Newsletter, our Weekly Supplements, announcements of our Grounds and Sounds Cafe shows and our other email notices, please click here. When you subscribe, you can expect to receive 1-2 emails per week. Thank you!